Here are some of the most common questions that we have recorded. In case you need something more specific, please feel free to contact us. Optional extras that you may have required e.g. safety net for children etc. We can provide you relevant charges upon request of the optional extra equipment. What are the things that we should take with us for our sailing vacations? You should take with you casual clothes and shoes that will make you feel as comfortable as possible when moving on the boat. Weather in Greece during chartering period is usually sunny, so you need to take with you sunglasses, sun screens, sun hat and of course your swimming suit and sea towels. On the other hand, an extra sweater and a waterproof jacket may be needed in lower temperatures and in case of rain. Avoid taking clothes and stuff that is not likely to use during your charter as they will make your life more difficult both during your travelling to Greece and onboard as well. Last but not least, prefer soft sided bags rather than hard suitcases as the latter are not very convenient in a sailboat. What are the advantages of booking a sailboat with a skipper vs. bareboat? A charter with a professional skipper on board will give you the chance to bring your sailing vacations experience to the next level. If you have some sailing experience and you would like to, you can take the helm and feel the boat slipping on the water under the supervision of the skipper. On the other hand, if you are new comers to sailing you just relax and focus on enjoying the trip or ask the skipper to teach you the basics of sailing. 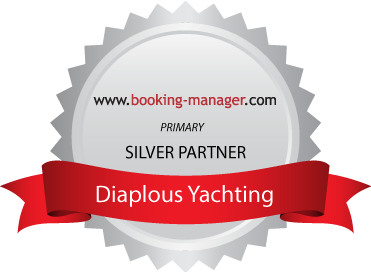 In any case a professional skipper of Diaplous Yachting onboard ensures tranquility, security and full enjoyment to your sailing vacations in Greece. Is gratuity included in skipper’s fee? Skipper’s fee doesn’t include the gratuity. If you are absolutely satisfied with the professionalism and the effort of your skipper to have memorable sailing vacations then it is customary to give him, at your discretion, a tip of 5-10% of the charter fee. For how many days should I need to book the boat to get a good sense of Greek islands? There is no correct & wrong answer to this question. It’s clearly a matter of your availability. Starting from our base in Alimos (Kalamaki) Marina, one week is great for a sailing trip in Saronic Gulf visiting some beautiful small islands and also some places in Peloponnese coast. It’ also great for choosing a route to those Cyclades islands closer to Attica (see map). On the other hand, if you have two weeks or more you have much more flexibility and you can combine Saronic Gulf with Cyclades or just focus on the latter and visit some of the most cosmopolitan islands of the Mediterranean like Mykonos or Santorini. Of course, as always with yachting, the route is depending on weather conditions and experience of the crew as safety is our primary target. What is the charter’s schedule? All charters start at 17:00 of departure date and end at 09:00 of arrival date. However we will do our best to offer the boat ahead of 17:00 while you need to be back at the last evening of you charter. This time between charters is critical in order to ensure that the boat will leave for the next trip in excellent condition. Can we charge our electric devices e.g. mobile phones on board? The yacht is equipped with an inverter so charging of electric devices like mobile phones or laptops is possible even when the engine is not operating. However you should take into account that you will not be able to use electric devices with high energy consumption like hairdryers etc. How do we settle our provisions for the trip? You do not have to worry for this.We can make an order to some of the super markets that are close to the marina prior to your departure and within an hour they will have delivered your order onboard. However, since Saturdays at high season are really busy... we suggest to send us a list of the provisions that you desire and we will arrange this for you. Just be as specific as possible to your description of each item to avoid unecessary communications and delays. That way, even your beer will be as cold as possible at boat's fridge!